With a deep sorrow we inform that Ing. Ivan Hlaváček, DrSc., long term researcher in the Institute of Mathematics, passed away on 22 July 2018 at the age of 85. He was a renowned specialist in numerical analysis, theory of elastic and elasto-plastic bodies, optimization and problems with uncertain data. 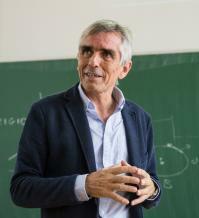 President of the Czech Academy of Sciences Prof. Eva Zažímalová awarded Eduard Feireisl the Honorary Bernard Bolzano Medal for Merits in Mathematical Sciences. The ceremony took place on 19th December 2017 in the Institute of Mathematics of the CAS during the international workshop Prague Compressible Meeting organized to celebrate Eduard's 60th birthday. Eduard Feireisl is one of the world leading specialists in mathematical theory of fluid mechanics whose ideas made a breakthrough in understanding the mechanism of compressible fluid flow. Since 2013 he has been the principal investigator of the ERC Advanced Grant MATHEF. He is among 7 world researchers supported in 2018 by the Einstein Foundation in Berlin. The Seminar is organized in cooperation with Bobcat Doosan. The seminar will take a place in the Blue Hall of the IM CAS on December 11, 2018 from 13:30. The goal of this special event is to commemorate work of the outstanding Czech applied mathematician and numerical analyst, Dr. Ivan Hlaváček, who passed away on July 22, 2018. The second Prague Summer School on Discrete Mathematics was held in the week July 16-20. Three lecture courses for 42 participants from fourteen countries were delivered by Piotr Micek (Jagiellonian University, Poland), Aleksandar Nikolov (University of Toronto, Canada), and Péter Pál Pach (Budapest University of Technology, Hungary and University of Warwick, United Kingdom). These courses covered recent breakthrough results of the speakers. Piotr Micek talked on structural aspects of partially ordered set. Mathematical and computational aspects of combinatorial discrepancy were covered in the lectures by Aleksandar Nikolov. Péter Pál Pach focused on the so-called polynomial method. The highlight of his lectures was the cap set problem. This problem, which has been central for mathematics since the work of the Fields medailist Klaus Roth in the 1950's, was solved by Pach in collaboration with Ernie Croot, Vsevolod Lev, Jordan Ellenberg, and Dion Gijswijt only in 2016. The school was organized by the Computer Science Institute of the Charles University and the Institute of Mathematics of the CAS, with a financial support from Charles University, the Czech Academy of Sciences and the RSJ Foundation. The next edition of the school will take place on the premises of the Institute of Mathematics of the CAS in 2020. More information about the school can be found at http://pssdm.math.cas.cz/. The Institute of Mathematics of the Polish Academy of Sciences established the Barbara and Jaroslav Zemánek Prize supervised by the Barbara and Jaroslav Zemánek Fund. The prize is granted annually to a person younger than 35 years at the end of the year preceding the award of the prize, and it is granted for achievements in the fields in which Jaroslav Zemánek was active, i.e. functional analysis, with special emphasis on operator theory. Jaroslav Zemánek (3. 9. 1946 – 18. 2. 2017) worked in the Institute of Mathematics CAS in 1969–1982. Among five members of the Prize Jury is Vladimír Müller from the Institute of Mathematics CAS. Waves are one of the most distinct and most important phenomena in fluid mechanics. The aim of this summer school is to present a comprehensive series of lectures on various aspects of waves and their role in mathematical analysis and numerical simulation of different types of flows. The Institute of Mathematics of the CAS and the Computer Science Institute of Charles University are organising Prague Summer School on Discrete Mathematics which will take place in Prague, July 16-20, 2018. Piotr Micek, Aleksandar Nikolov, and Peter Pal Pach will deliver three lecture courses. Matematický ústav AV ČR je účastníkem projektu Doktorská škola pro vzdělávání v oblasti matematických metod a nástrojů v HPC Operačního programu Výzkum, vývoj a vzdělávání. V rámci tohoto projektu bude 8. a 15. března 2018 v Matematickém ústavu AV ČR přednášet Ing. Jiří Mužák, Ph.D., ze státního podniku DIAMO na téma Historie a současnost těžby uranu v Čechách a Aplikace numerických modelů při odstraňování následků těžby uranu. Bližší podrobnosti jsou v letáku níže. Všichni zájemci jsou srdečně zváni. Two PhD scholarships are available in the framework of the Einstein Visiting Fellow programme at TU Berlin within the Collaborative Research Center ”Control of self-organizing nonlinear systems: Theoretical methods and concepts of application”. A successful candidate is supposed to work under the supervision of Eduard Feireisl on problems related to the mathematical theory of fluid mechanics. Basic knowledge of PDE’s and functional analysis, including the framework of Sobolev spaces and weak solutions is required. The scholarship is granted for 3 years and amounts to about 1450 Euro per month (tax free, no insurances included) starting April 2018. The PhD student is supposed to settle at TU Berlin. For more information contact Eduard Feireisl (feireisl@math.cas.cz) or Etienne Emmrich (emmrich@math.tu-berlin.de). Please, send your application together with a CV via e-mail to diffeqs@math.tu-berlin.de not later than by March 4, 2018.